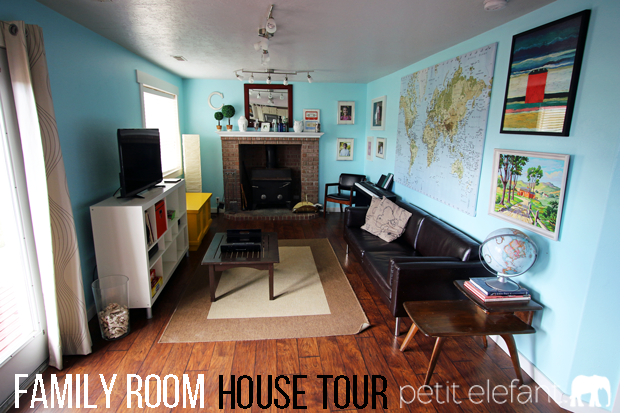 My family room is on tour today, just for you. It’s been a little while since I’ve shared a room tour, any home decor, really, so I thought I’d show you a peek into my house. It has a little mid-century modern flair, using inexpensive furniture and decor, and it’s one of my favorite rooms in my house – a little slice of heaven. Our house is an early 1990’s builders kit that the previous owners built from scratch. There are so many weird idiosyncrasies, I don’t even have enough space to share them all here. It has taken us the better part of 13 years getting this house up to speed, and we still have so much work to do. One of the weirdnesses of our house is how narrow it is – the family room being the perfect showcase of bad proportions. It doesn’t look super odd here but I promise you, getting this family room usable has been a trick of using the right furniture and design layout. 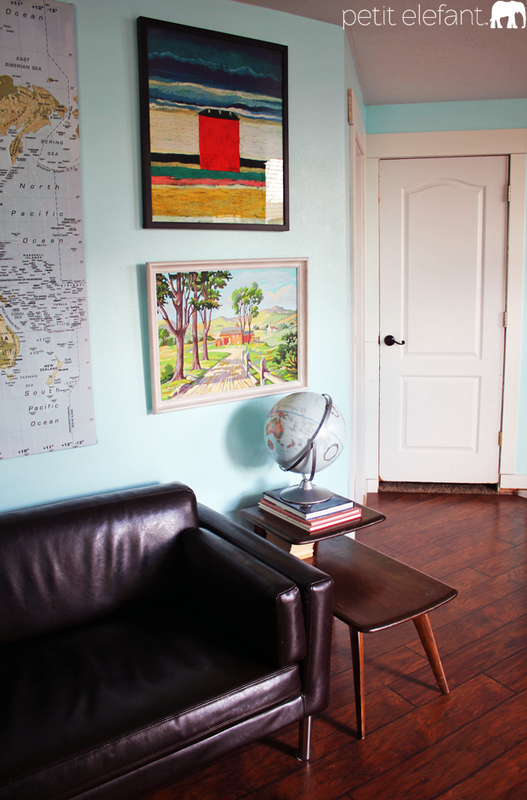 The width of the room is unusual, and it’s been super hard to furnish. In the end, after trying a whole bunch of different configurations and types of furniture, we just scrapped the whole thing and ripped out the trim, flooring, and wood paneling (oh, yes!) and started from the bottom up. 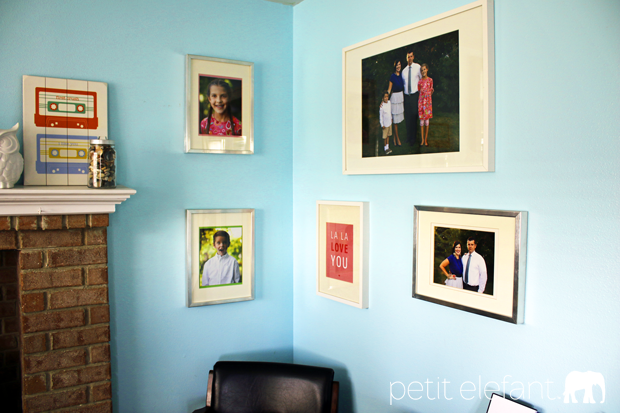 I painted the walls a gorgeous bright blue, we put down laminate wood flooring from Costco, my husband built and painted new white trim, and then we went to IKEA. IKEA is great if you’re trying to furnish small or weird spaces because the proportions of their furniture are meant to accommodate smaller European homes. 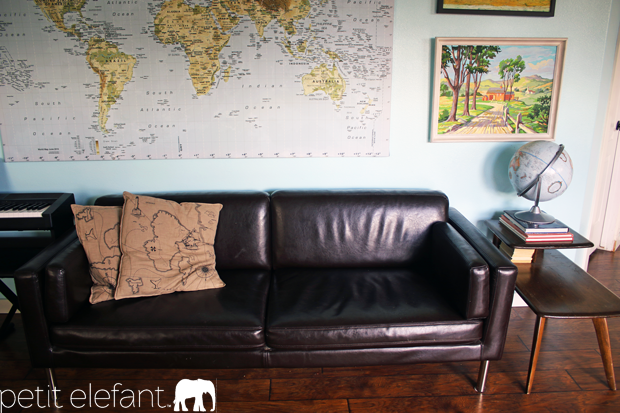 The sofa we bought is one of the few we found on the market narrow enough to create a living space in front of it, with a coffee table and an entertainment center. Plus, let’s talk about being affordable. Yay, IKEA! 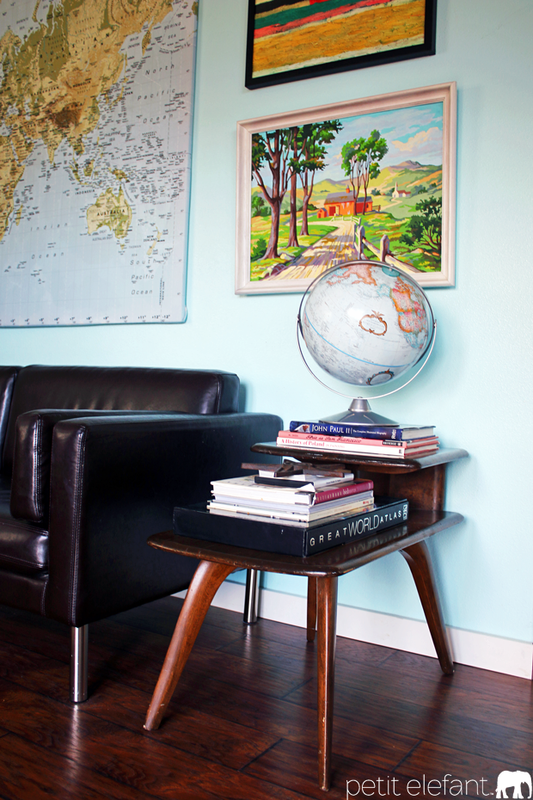 The end table is probably my favorite piece in the whole room, the most mid-century modern piece in the house, actually. I found it in the scratch-and-dent pile at my favorite local antique store for $75. Turns out it’s a pretty hard-to-find table, which I discovered immediately when I tried to find a matching one. I LOVE it. The smooth lines on the end table delight me to no end. It’s just so simple and gorgeous. 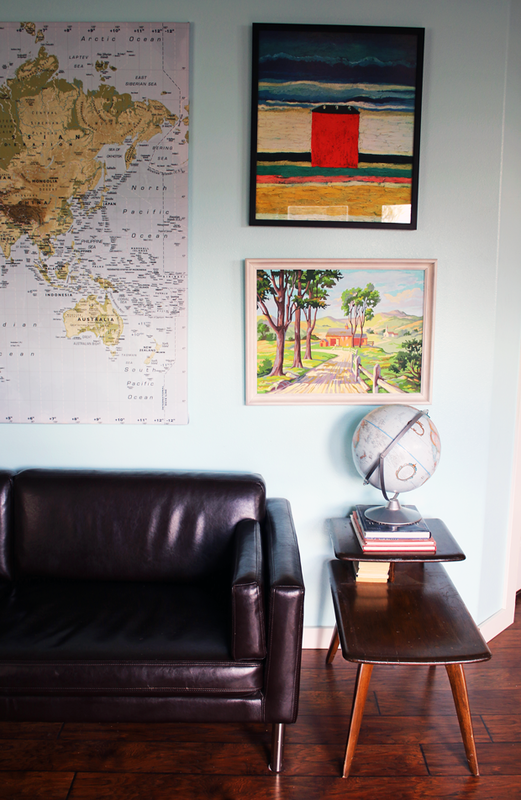 The art and the rest of the decor is really a hodgepodge of all sorts of things: the red house painting is a piece I got from Art.com, Red House by Kasimir Malevich, and the painting underneath it is a paint-by-number I found at the antique store, again on clearance. It had a nasty brown frame I painted white and now it’s just perfect. I found the letter ‘C’, the white porcelain owl and white head all at T.J.Maxx, a great / addictive place to find inexpensive home decor. 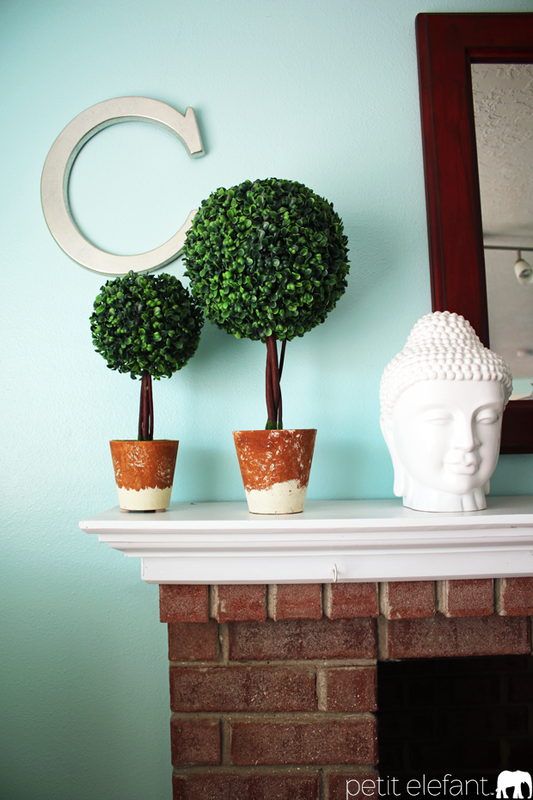 The topiaries are from Downeast Home. 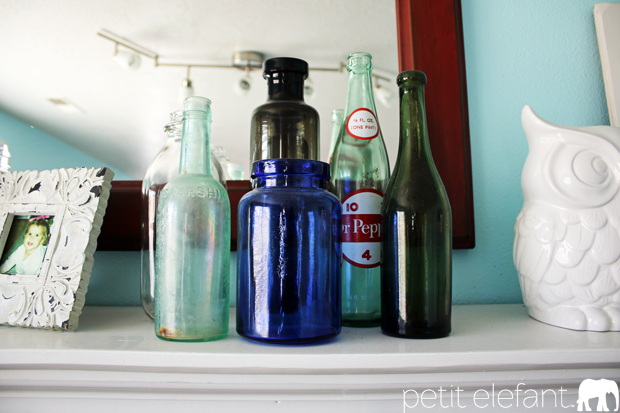 The glass bottles are all from my favorite antique store: an old Dr. Pepper bottle, a couple of milk jars, and a few random bottles. The colors are all reminiscent of ocean, which if you’ve seen any of the rest of my house, you’ll know is a bit of a problem theme. I’m an ocean girl landlocked in Utah. But having a very Costa Rica-esque remodeled master bathroom helps soothe my ocean blues, so don’t feel too sad for me. 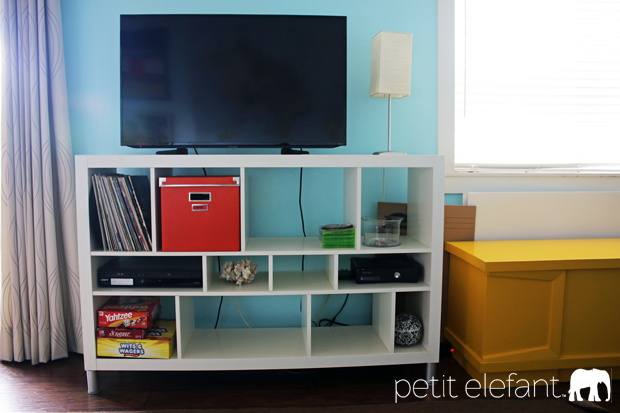 The entertainment center is from IKEA as well. Again, it’s narrow and fits an assortment of bins and boxes for all the things that end up in your entertainment center: random DVD’s and video games, board games, an X-Box, records, odds and ends. I love that the little pedestal feet on the entertainment center match those on the couch. A very mid-century feel. P.S. all the light fixtures are from IKEA as well. Because of course they are. 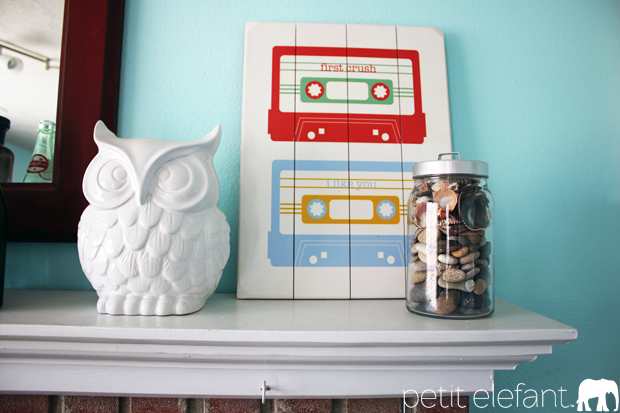 I love the mantel. See those 4 hooks? One for each of us to hang a stocking at Christmas time. I feel a bit like Steve Martin in Father of the Bride, talking about my house. It’s jam-packed full of happy, child-rearing memories. Let’s talk about this mix-tape art. I got it on Etsy about 5 years ago, and I. LOVE. IT. A tongue-in-cheek nod to my 80’s and 90’s upbringing. 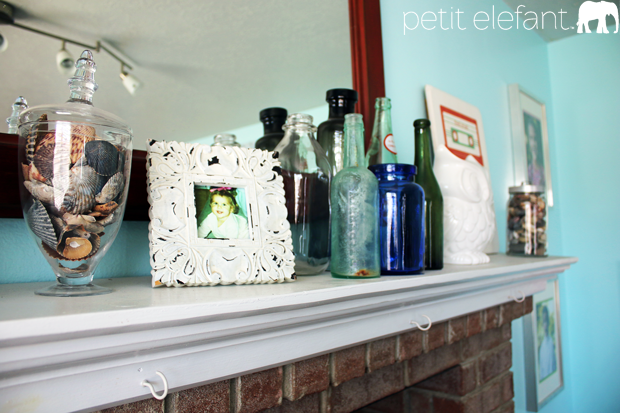 Again, the jar (from IKEA, let’s be serious) full of seashells and ocean rocks fits right into the theme of our house. We have a lot of little subtle echoes of the sea throughout the house, especially in this room. 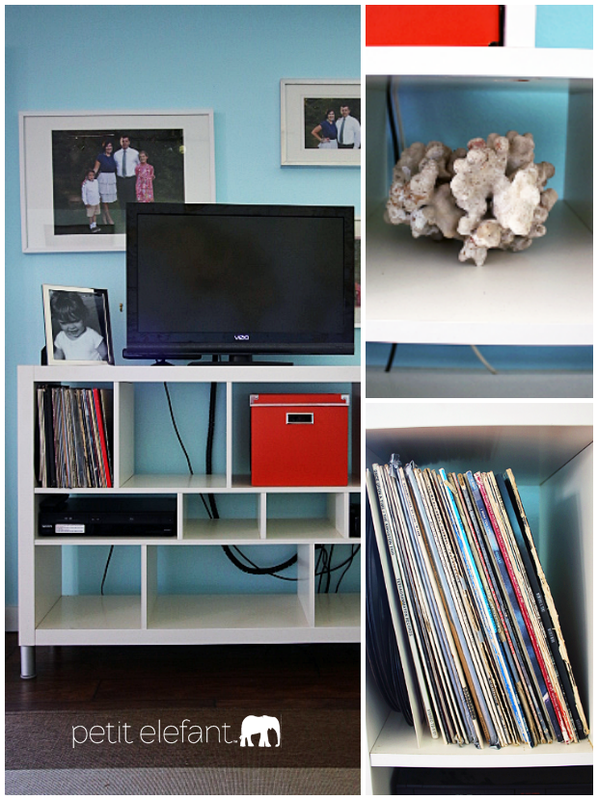 If you look closely in the entertainment center there’s a big hunk of coral in the middle of one of the shelves. 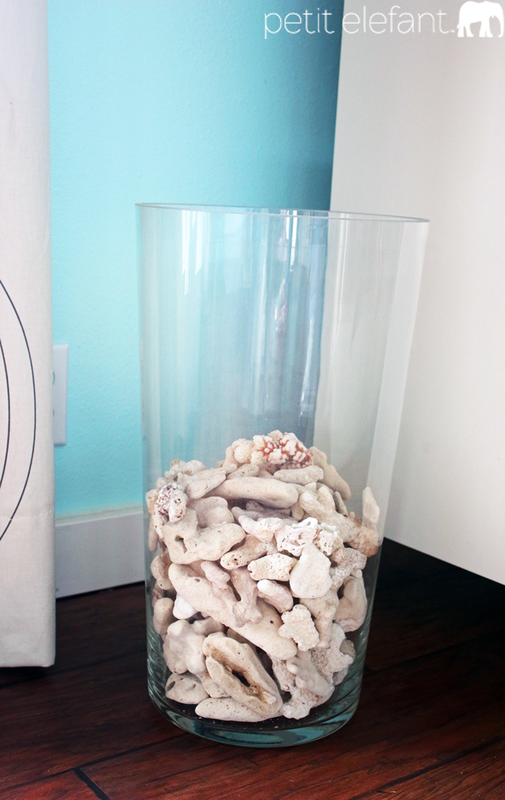 And then there’s our huge glass vase full of coral we collected on a family trip to Hawaii. 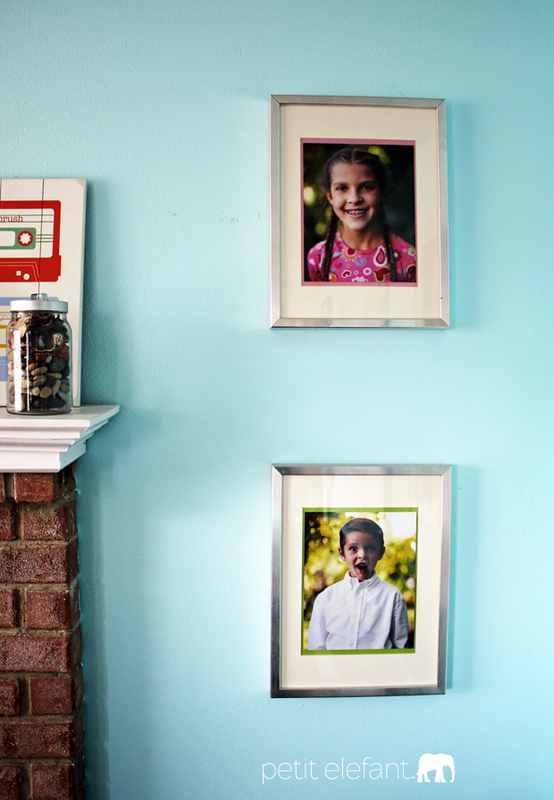 One of the best things about this family room is the wood burning fireplace. As you can tell, we use it regularly all winter long. It makes the family room such a cozy place to snuggle up and watch a movie together as a family. The gold kindling basket is from a thrift store. 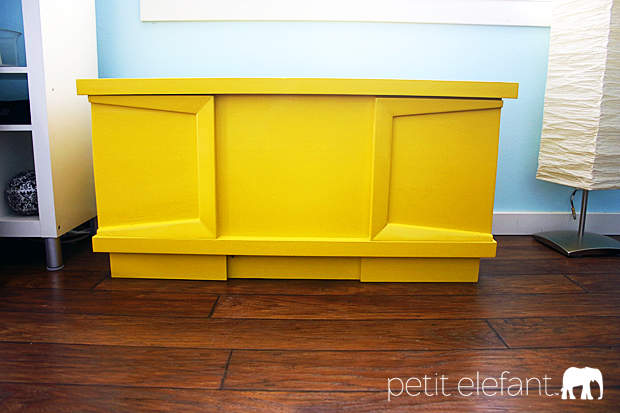 The yellow cedar chest is so great – I love the way it came to be. I bought a totally banged up, terribly re-painted mid-century modern cedar chest at my antique store (I’m a bit of a regular), in need of a good paint job. 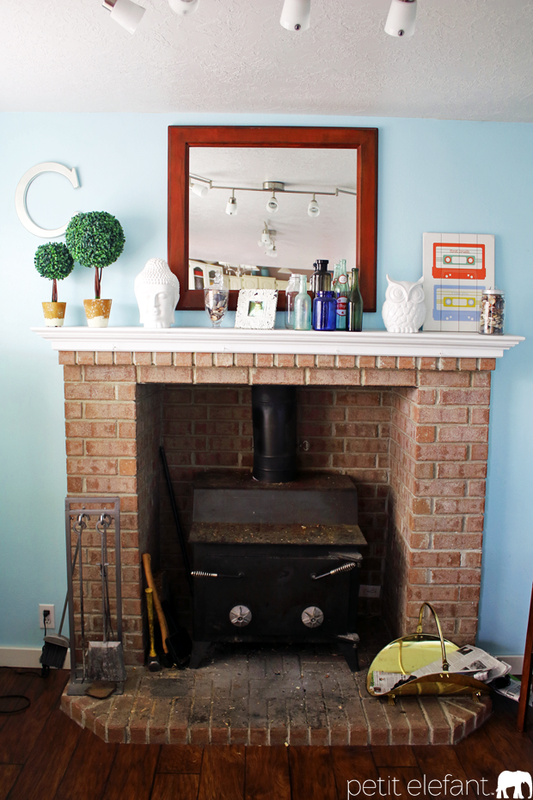 We sent it out to a wood guy to paint, and he totally jacked it up – so my husband joined a nighttime wood shop class at a local high school and built me a new one from scratch. He even lined it with cedar and painted it with the same bright yellow, glossy automotive paint finish he used to paint our sliding barn door in the master bedroom. It sits there just looking pretty and holding blankets for movie nights. P.S. I married the best guy. The opposite corner from the cedar chest is a chair we rescued from a house that was being demolished. All it needed was a little spit polish and it was good as new. 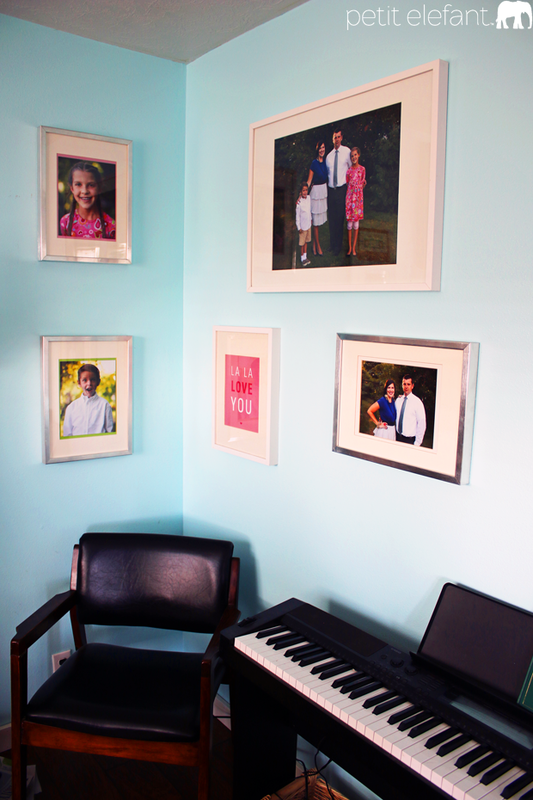 The electric piano is from Costco, and the photos are from Justin Hackworth, framed by, you guessed it, IKEA. The rug is a super cheap-o from IKEA, so we can eat treats while we watch movies and not worry about spilling anything on it. I think it was $20. Boom. Perfect for little kids. 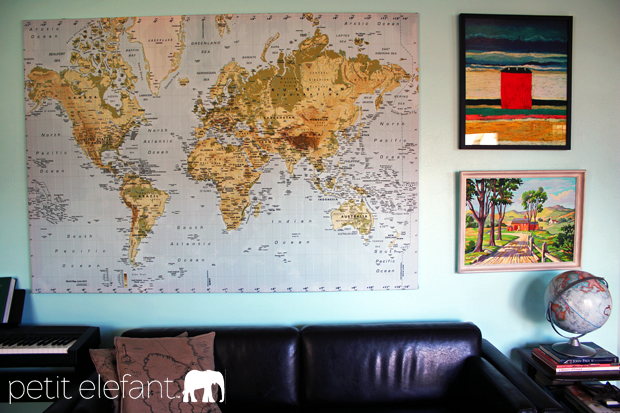 Lastly, are the sliding curtains that cover the french doors, and huge wall-sized global map. Both are from IKEA (it’s a problem at this point). There you go! I hope you enjoyed the house tour of my family room. Come over and visit sometime. I love it! I’ve been re-doing our living room and man, it is hard to find furniture that isn’t expensive, but has a more modern style and not the much loved Utah overstuffed style. That table is amazing! What thrift store do you frequent?